A few weeks back, I shared a Mother’s Day tribute post. So with the arrival of Father’s Day, and my Dad’s birthday being just around the corner, I thought back on one of my most special Dad memories. My Dad’s birthday is on the 4th of July. For years we woke to the mixture of him blasting John Phillip Sousa’s Stars and Stripes Forever and my mother shouts of “Turn that music down, Jerry.” As little kids, we really believed him when he told us that the fireworks were in honor of his special day! We spent all his birthdays at my Aunt and Uncle’s and Grandparent’s summer cottage on Henderson Harbor, in upstate New York. The only time during the 4th of July that I wasn’t in the water, or making tents out of towels on the lawn, or running around with lit sparklers, was when everyone gathered around Nam and Gramp’s black and white, rabbit-eared TV to watch Wimbledon. I remember one year in particular, sitting on the floor, leaning back against Dad’s legs, watching Chrissy Evert battle Martina Navratilova. Chrissy had just hit a beautiful winner down the line. “Dad,” I said, “I bet she could beat you.” Everyone had laughed. Confused and embarrassed, I pulled my knees into my chest, until Dad patted me on the back. Then I realized my silly mistake. Of course she couldn’t beat my Dad. Nobody could beat my Dad. For years, I’d been sitting on the grass outside the tennis courts, watching him play. His opponents would always tease, Oh no, he’s brought his good luck charm, and I’d wait for them to finish so I could get on the court with my Dad. I’d stand on the opposite side of the court, trying to return his serve, trying not mis-hit the ball as he charged the net, trying to win that promised hot fudge sundae if I ever beat him. We’ve been playing for years and I’ve yet to win that sundae! The summer I turned 16 was the first I’d ever spent away from my Dad on his birthday. But, I did spent the day at The Wimbledon All England Lawn Tennis and Croquet Club! I’d traveled to England on a High School summer exchange program and a group of us spent the night sleeping on the payment outside the stadium in hopes of securing tickets. When the gates opened on the morning of July 4th, we were tenth in line and ended up with front row seats on Center Court! I remember trying to mentally record every detail so I could later share it with my Dad. The reel still plays in my head of the traditional bowl of strawberries and cream, the delicately manicured bright green grass of the courts, our Chrissy playing just yards away from me, the misbehaving fans screaming from the standing-room-only section, and Jimmy Connor’s bow to Princess Diana that made her blush so deeply. Princess Di was so pretty in a soft, fuchsia dress that several times I ended up watching her instead of the tennis match. And there I was, across the ocean from both my Dad and a country celebrating birthdays. A 16-year-old girl experiencing her first true taste of independence, all the while wishing my Dad was by my side to share it with me. 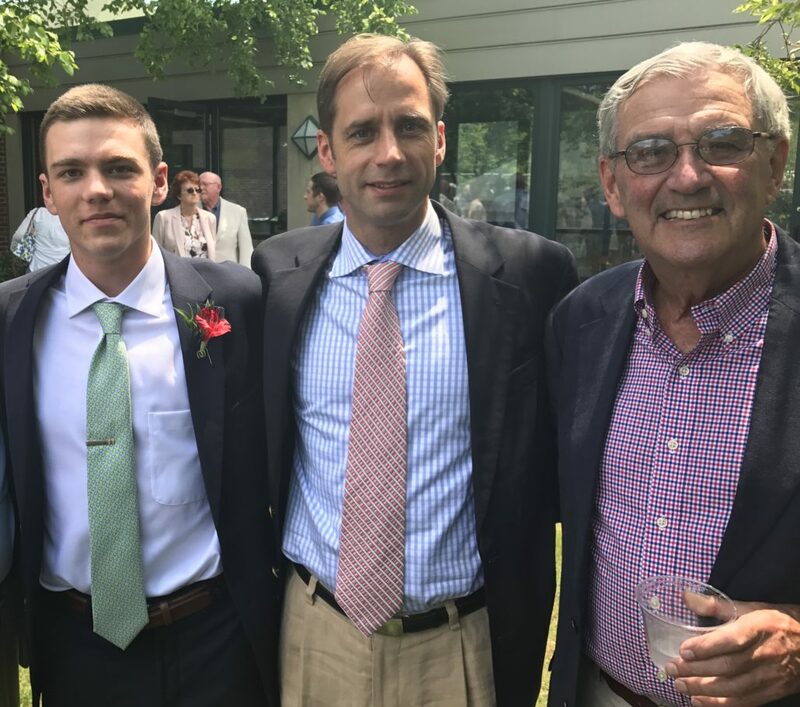 My Dad with Lee and Tucker at Tuck’s HS graduation last weekend!